So, the eagerly anticipated final stages of this summer’s transfer window haven’t quite created the crescendo of noise many were waiting for, as markets ring the closing bell all around Europe. After 11pm tonight, most clubs in the major leagues across the continent won’t be able to sign any new players, but crucially, can still sell to English teams with our deadline for registering new recruits not until 6pm tomorrow. So far, the biggest deals of the day both involve Manchester United, with David de Gea reportedly set to swap places with Real Madrid ‘keeper Keylor Navas, and Antony Martial poised to sign for United from Monaco for a fee as scandalously high as Diego Maradona at USA 94. Meanwhile, Arsenal stories this rain-soaked Bank Holiday have been limited to a potential outgoing, with Joel Campbell rumoured to be on the way to France with Rennes. I can’t say I’m surprised or disappointed or anything really, because the window hasn’t shut yet. But if we haven’t brought anyone in by this time tomorrow, I’m guessing my overwhelming feeling would be one of confusion. Alexandre Pato – because somebody noticed the former AC Milan forward follows Arsenal on Twitter. Antoine Griezmann – he cryptically tweeted that he’ll find his ‘match’ tomorrow and advised followers to ‘stay tuned’, which did make me wonder if he was referring to a new club, or a new wag. Both are equally possible at this stage. Gabriel Barbosa – apparently reports from Turkey, a country he allegedly declined to move to recently, suggest Arsenal are in for the latest teenage Santos striker to be dubbed ‘the new Neymar’. Edinson Cavani – Arsene Wenger’s been snapped on a flight to Paris which must mean he’s negotiating for a PSG player. Plus Match of the Day and the BBC seem to think it’s a possibility. I don’t see it. Adrien Rabiot – see above. Nacho Monreal – he started following Athletic Bilbao on Twitter today and has been repeatedly linked to the Basque club in recent times. It’d be a strange one, although Napoli’s left back Faouzi Ghoulam was strongly linked with a move to Arsenal earlier this summer. Could 2 plus 2 make 4 for once? Probably not now, as Spain’s deadline passes in about half an hour as I type. And I’ll stop there because it’s rather pointless and also a little depressing. On the one hand I’m always confident in our players, particularly our current collection and also implicitly trust Arsene’s ability to improve them on the training pitch. Yet on the other I can’t get my head around the possibility of Petr Cech being our only addition this summer, particularly when we’re so awash with disposable income for player investment. He’s responded very well. David Ospina is a very strong man and a fantastic goalkeeper. He’s ready for the fight and will give Petr Cech a hard time. There will be enough room for him to play games as well, maybe sometimes to come in during the season. Why shouldn’t he be able to win his No 1 shirt back? That’s the target for him and I’m convinced he will fight for that. Back tomorrow when, with a little luck, I’ll have a new signing or two to talk about. 30th August 2015: Can we compete with City splashing obscene cash? A warm Sunday welcome to you. Man United lost at Swansea this afternoon, joining Liverpool and Chelsea as title hopefuls to drop all three points over the weekend, which considering our own slow start to the season, is very handy indeed as we enter the international break. The first thing to say looking at the eleven above as an Arsenal fan is, uh oh. The second is to suggest that just as a fourth placed finish is often dubbed a trophy, ending runners up to the seemingly infinite financial resources of Arabian Oil FC, ought perhaps to be awarded with the tag of ‘default champions’. In fact, make that a merit for third place behind Spartak West London, in which case thinking about it, we’re reigning champions. Because even the best management in the world can’t compete with such outlandish rival spend, no matter how many people say there’s more to winning than money. 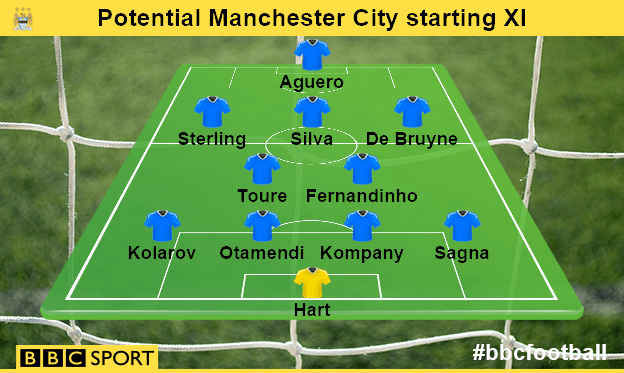 At this level of investment, I’d wager Barry Fry would walk the league as Manuel Pellegrini is threatening to do now. Is it merely coincidental that Chelsea and Man City have won six of the last 11 championships with the other five heading to United, who may not have a bottomless-pocketed benefactor bankrolling their buying, but are easily the most resourceful team in the country without one? Money matters in football and should shape any conversation regarding what constitutes success, so should we readjust our expectations for the rest of this season? I think we probably should, even at this early stage of the campaign and certainly if we fail to bring in one or two ‘top, top, top’ signings before the window shuts on Tuesday evening, because as much as I take the point that improvement can be achieved on the training pitch and through the development of our current set of players, there’s also an intangible ‘lift’ that sweeps up a squad when a quality new team-mate arrives from elsewhere. We are open and we are in the transfer market. If we find an exceptional player in any sector, we will do it. At the moment I don’t know if something will happen or not. A predictable response from the boss there and with less than 48 hours of the market to run and no noises of any incomings at all, let alone game-changing captures, it did make me wonder how costly a strategy waiting for rivals to show their hand might prove. I mean, the widely held belief all summer has been that we’re waiting for the end of the window for an Ozil-like superstar to become available at the last minute and there’s few players out there who could markedly improve our squad otherwise. But having watched Roma host Juventus earlier today, I felt two strikers were on show who would have significantly improved our current options and who have both changed clubs this summer – Edin Dzeko and Paulo Dybala. That said, Dybala reportedly chose to remain in Italy despite our interest and City may not have done business with us for Dzeko on the basis we’d be competing in the same league. But still, it reminded me that to think only a handful of players out there could make us a better team is silly. There are plenty, as along as we identity and pursue them. We may, I fear, have become obsessed with the top draw of the transfer chest when there are rubies and diamonds residing in ones beneath, albeit covered and surrounded by counterfeit crap like Danny Ings (this year’s pointless and baffling Liverpool purchase like Rickie Lambert was last). You don’t have to shop at Harrods to buy a Rolex, or something, although mistaking a Casio for a Cartier, admittedly becomes an increased possibility in what are usually the frenzied last few hours of shopping. So watch out Arsene – we can all do without another Kallstrom, if a Krychowiak really is a no-go. Welcome back. It was a case of points over performance for Arsenal today, as a deflected second-half strike by Alex Oxlade-Chamberlain secured us three precious points at Newcastle, from what was a pretty forgettable game. After saying yesterday that I didn’t think Arsene Wenger would drop Olivier Giroud or play both the Ox and Theo Walcott together from the start, of course the boss did just that. Walcott replaced Giroud at the tip of our attack and the Ox came in for an injured Mesut Ozil to play on the right, with Ramsey shifting across to take his place behind the striker. Less surprisingly, Laurent Koscielny had recovered from his back injury and replaced Calum Chambers in what was the third and final change from Monday night. Right from the off it became apparent the hosts would defend deep and in numbers and struggled to get near the ball as we bossed possession without looking too dangerous in the opening exchanges. Theo Walcott made a couple of decent runs but it was a foray from fullback that drew the first major talking point as Hector Bellerin was fouled inside the penalty area by Florian Thauvin. Just after the quarter-hour mark, Newscastle’s new signing Aleksandar Mitrovic mistook Francis Coquelin’s shin for the ball, came in with a stampy ‘challenge’ and received a straight red card from the referee. Cue mass hysteria from a noisy home support but the the decision stood and off sauntered their new ‘star’ striker. Now with a numerical advantage, we controlled proceedings even more but still couldn’t find a breakthrough as Walcott went AWOL from the game, Ramsey ran around a lot but did nothing of any note, the Ox played like he couldn’t be arsed/had never played football before, and a slow, dry pitch sucked any zip from our passing. Oh, and about 24 Newcastle players got booked as they tried to hack down anyone in sight. The second half began with more of the same as any remote glimpse of our goal Newcastle had was easily blocked out by our defence, where Gabriel again impressively played with the minimum of fuss and the maximum of focus. Petr Cech was so inactive, he must have been tempted to ring a pal for a catch-up. Then finally, our possession and patience paid dividends on 52 minutes when the Ox produced his only piece of play reminiscent of a footballer and drove the ball towards the far corner following two blocked attempts at goal by team-mates. It was actually going wide but the poor man’s Carles Puyol – Fabricio Coloccini – deflected the ball into his own net. After that, Giroud came on for Where’s Walcott and sliced an effort so wide the ball ended up in Sunderland, and Mikel Arteta entered the ‘action’ for the Ox as the game drifted to a tame conclusion. As you may have guessed by the tone of this post, I didn’t really enjoy the match that much. I’ve seen better, let’s just say. Yet the points more than make up for my lack of entertainment and I’m sure we’ll find our finishing boots and jogo bonito, rat-a-tat rhythm soon after the international break. Patience and nerves (were key). I believe that we needed to not rush our game, to wait for our chances and to take one of them. I must say that Newcastle decided from the start to make the game quite physical and we had to keep our nerves and not become a little bit aggressive as well. I thought we did that well. Afterwards it was a strange game. You play away from home, 11 against 10, and you know that they will play 15 yards deeper, you play 10 against nine in the final third, the crowd is behind their team which puts pressure on the referee, and then it’s very difficult. We didn’t find the space. They defended well and they’ve shown why they didn’t concede at Manchester United as well. We are happy to have the three points and to win 1-0. I expected more space for Theo Walcott. At the start it looked quite promising but after 15 minutes it was a different problem for us. There was no space behind their defenders, the service through their lines was very difficult and they defended very well. Which is very diplomatic of the boss and obviously has an element of truth but for me, Theo’s problem wasn’t a lack of space, it’s a lack of balls. He’s simply far too timid anywhere he plays on the pitch, and against the uncompromising, oafish centre backs that populate the Premier League, he becomes not so much a passenger in proceedings as a sleepy spectator. He may as well get his video camera out like it’s Germany 2006. I’m sorry if this sounds harsh but it’s frustrating to see a player who I rate very highly – more so than most – being held back by a lack of fire in his belly and a complete lack of confidence. I think Theo’s finishing, pace, movement is all top notch and he has a better footballing brain and first touch than people give him credit for. But he needs to ‘man up’ for want of a better phrase. Whether he ever will, I’m starting to doubt but if I could offer him any words of advice as a mere fan from afar, it would be play with more mental freedom Theo, take more risks, back your ability and don’t be afraid to make mistakes because everybody does. As the old adage advises: get stuck in! Welcome to Matchday Eve, which for the first time this season, is otherwise known as Friday. Although it’s great to have Arsenal play in the Premier League on a Saturday for the first time in what seems like about 33 years, it does mean that once we’ve devoured our Gunners-flavoured goodness by 3pm tomorrow afternoon, it’ll be an eternity until we’re back in action thanks to the international break. Anyway, before we have to endure that excruciating absence of Arsenal, we have the small matter of a trip north to St James’ Park, to take on a very new Newcastle, boasting new players, a new manager and in the form of wannabe Mario Balotelli – Aleksandar Mitrović – a whole new level of striking spike. Mertesacker is still sick and we will know more about Koscielny today. He might have a test on his back today and I will certainly know more tomorrow morning. The less likely to be fit is Mertesacker. I would like them to be available but that’s part of the season, you can’t complain about that. Danny Welbeck is progressing well. He should be available, if all goes well, after the international break. Jack Wilshere is just behind Welbeck, maybe one week after the international break he will certainly come back into full training. I think we are ready to play 90 minutes but maybe it’s normal as well that after two or three games, you are not completely at 100 per cent. That comes slowly. We have started late and as well some players, like Alexis, have come in on August 3 and are not completely there. Our results away from home, with goalscoring opportunities and our finishing percentage has been higher recently. Teams come and defend very deep at our home, so as long as we have not scored the first goal it is maybe more difficult to open up the defences and in the recent two games that is what happened to us. Maybe we are not firing on all cylinders at the moment. By definition, the finishing is a little bit cyclical and it goes in cycles. Finishing qualities come and go and you do not always know why, but certainly at the moment we want it so much at home that we’re trying to force it a little bit. It doesn’t look natural enough in our finishing qualities because we want to force the situation a little too much. We want to do well at Newcastle but it’s always very, very, very tight and very committed there because the crowd is always behind their team. They have just come out from a good result at Manchester United so it’s important that we prepare well and we give absolutely everything to win this game before the break. Which brings me to what our starting line-up might look like come 12.45pm tomorrow. I think if Koscielny has recovered from his back injury (and snaps of him in training today suggest he has), then he’ll come straight back into the side with Gabriel shifting to the right of him and Calum Chambers dropping to the bench. The rest of the back five picks itself you’d have thought, so the only real question marks, I suppose, revolve around the potential inclusion from the get-go of Theo Walcott and Alex Oxlade-Chamberlain. I really can’t envisage Arsene bringing both in and I doubt he’d drop Olivier Giroud after the Frenchman grabbed two goals in the same fixture last season. That said, I think we could do with a little more pace in the side and although I felt he preformed very well on the whole against Liverpool on Monday night, if anyone was to be dropped to accommodate one of Theo or the Ox, I’d be leaning towards leaving out Ramsey. We’ll find out soon enough I guess. Evening all. The draw for the group stages of the Champions League was made earlier today and we were pitted against Bayern Munich, Olympiacos and Dinamo Zagreb in Group F, which, looking at Manchester City’s group, I’m not going to complain about too much. Or at all in fact. Typically, Chelsea and Man United were put in groups their under 9s would top, but ours looks pretty straight forward too, Bayern aside of course. I mean, not to sound complacent or cocky, but if we can’t at least secure second spot in this group then I’d give the entire squad a free transfer because they’d deserve it frankly. But far from such a shocking scenario occurring, the early-season optimist in me sees no reason why we can’t actually top the group, handing Pep Guardiola’s Bayern a beating or two along the way. I mean, in our four recent meetings with the German champions, we’ve won one and drawn the other of two away games, while our two losses at home had mitigating circumstances. When they beat us 3-1 at Emirates stadium in February 2013, our team was very different to the one we have now, and by different, I mean much worse. A year later, Wojciech Szczęsny was sent off early on, handing the visitors a numerical advantage for most of the match. So I don’t think it’s a foregone conclusion at all that Bayern will top the group, no matter how likely Owen Hargreaves thinks it is. Time will tell I guess and of course there’s also the possibility that finishing second can provide a more favourable draw in the next round so there’s always that to consider too. The only side that truly worries me in Europe is Barcelona, with their three footballing freaks up front and an already perfectly balanced midfield now strengthened by this summer’s capture of Arda Turan. Other than the Catalans though, bring them on I say. Surely it has to be our year some season soon, so why not this? That [home leg] was a great night and a great performance. I also remember something which happened before the return leg in Spain. I was doing the press conference at the Nou Camp the night before the game and I saw Lionel Messi at the top of the stairs. I was chatting to him, then the boss came up to me afterwards and joked, ‘Theo, why didn’t you push him down the stairs?!’. That has never left me, I thought it was brilliant, really funny from the boss. I think he scored four goals the next day as well. It’s things like that that are great memories, because people don’t see that side of it. That home game against Barcelona was definitely something special though. Yeah, so, on second thoughts, I’m not sure Theo should find Messi scoring four against us funny but I think he was talking just about the stairs bit in fairness. But moving away from the draw in Monaco and onto a former Monaco manager, Arsene Wenger held his pre-match press conference today as we prepare to travel to Newcastle for Saturday’s Premier League clash. It’s an interesting draw and we have had some fierce competition with Tottenham over the years, even in the League Cup. It will be interesting but for us it’s an opportunity to go through and we will take the competition seriously. Interesting. Anyway, I’m afraid it’s just a short post today because I have stuff to do. And by stuff I mean sleep. Early start in the morning, you know how it is. Welcome back. The draw for the third round of the League Cup was made last night and we got Tottenham away. Nothing much to add really, other than Sky Sports will be showing it live and I’m looking forward to Jeff Reine-Adelaide taking the tournament by storm. Incidentally, the draw for the group stages of the Champions League is made tomorrow afternoon and looking at this piece on the official site, I’ll take PSV Eindhoven, Olympique Lyonnais and Malmo please. More likely though, is that we’ll get PSG, Sevilla and Wolfsburg, giving our new signings Edinson Cavani, Grzegorz Krychowiak and Kevin de Bruyne the opportunity to return to their former stomping grounds. In seriousness though, it feels a bit odd seeing the likes of Real Madrid, winners of the competition as recently as 2014, in Pot 2, whilst Pot 1 is populated by teams such as Benfica, Zenit and PSV, but then I guess it is called the Champions League for a reason, so having domestic title winners in the top pot makes sense. The changes in regulation for how seeds are selected also provides potential for some really big games in the group stages, which perhaps the competition as a whole could do with given the mundane manner of many group stage fixtures in previous years. I want to score more goals than in the last two seasons and that’s my aim for this season. What’s important firstly is that we are successful as a team. That’s most crucial for us and as I said, for me it’s not just goals and assists that mean everything, what’s more important is that we’re successful as a team. My aim is to help the team and I’ll do all I can to achieve that. In truth I’m more the sort of player who doesn’t really go for goal, I tend to look for my team-mates and think, ‘Can I play this pass?’. I think now and then I need to become a bit more selfish – then I’d definitely score more goals. But I’m a player who thinks for the team first and not for my own needs and that’s why I will carry on to play the way I always do. I think that’s one of my distinguishing characteristics. Whilst it’s great to hear Mesut making noises about upping his goals output, I hope more of his colleagues are doing the same because Francis Coquelin aside, the other five members of any front six we choose should be regularly contributing to our tally. Particularly while our 70 goal-a-season, universe-class striker remains elusive in the transfer market. I’m always ready to play in any position on the field. Luckily I’ve played in many different places, such as both wings, behind the striker or as a midfielder. Therefore, I am no stranger to this new position. As soon as the manager informed me about my role change, I told him I was ready for it. To be honest I’ve found myself very comfortable in this new position since the very first day. I’m a player who needs to touch the ball as much as possible and for any possible purpose on the pitch, from giving an assist to a short pass. The more I touch the ball, the more confident I get and that’s why I need to have contact with the ball. If I don’t touch it for a period of time I feel uneasy. Thanks to playing in this new position, I’m touching the ball a lot and that makes me happy. I’m loving my new position on the pitch. And I’m loving you in your new position too Santi, most of the time anyway. I mean, I understand there are certain games where, as Arsene Wenger himself said recently, he prefers the more athletic, physical qualities of Aaron Ramsey alongside Coquelin, but for me, those games are the bigger ones where we may not dominate the ball as much and instead adopt a more counter-attacking style. For the rest, and certainly at home, I much prefer the ball re-cycling and game-controlling qualities Cazorla offers from the middle. But I’ve said that before. More than once. So I’ll stop now. We have started very averagely, I must concede, because we have four points after two home games. But statistics aside, what’s far more worrying than our déjà vu-inducing, early-season points deficit for me, is the fact we’re simply not playing very well, both individually and hence, collectively. As a team, we look a little weary which is ridiculous really, considering the campaign’s as young as it is. We should be fresh and focused and firing on all cylinders after a perfect pre-season and the capture of Petr Cech, but instead, we seem completely devoid of any spark. Our passing, bar a spell at Selhurst Park, has been woeful by our standards so far this campaign. And Alexis Sanchez just isn’t fit. I think it’s safe to suggest Arsene will privately be regretting his decision to reintroduce the Chilean back into the fold so soon after his delayed summer break following the Copa America. The fact that Alex Oxlade-Chamberlain, arguably our best performer in the opening day defeat to West Ham, enjoyed such a stellar pre-season, culminating in him scoring a stunning winner in the Community Shield against Chelsea, has been dropped to make way for an off-the-pace Sanchez, makes the boss’ selections look even more misguided. Anyway, for all our issues going forward, the clear worry when the teams were announced yesterday was the centre of our defence, where both Laurent Koscielny and Per Mertesacker were absent through injury and illness respectively. That meant a first competitive combination of Calum Chambers and Gabriel at the heart of our defence and the former endured an absolute nightmare first 45, repeatedly giving the ball away and being caught out of position time and again. One close up shot of the ex-Southampton man’s face by the Sky cameras perfectly captured his dismay as he struggled to put a foot right. He responded well. It was important for him. You sit there and you wonder how far he can go without losing competitive confidence. In the second half he did well. He’s a good footballer and he will come out of that stronger, with the belief that when he had difficult moments he can come out of it stronger. Yet despite Liverpool being on top for most of the first half, we did manage to score a perfectly legitimate goal through Aaron Ramsey, only to see it ruled out by a flag for offside. Sanchez also placed a header over the bar when he seemed certain to score in the opening period, which admittedly, had begun with Philippe Coutinho rattling the woodwork for the visitors. The second half was a very different affair, as we dominated the ball and Liverpool sat back to contain and counter. But for all our possession, we struggled to find the net despite creating chances. Most notably, Oxlade-Chamberlain produced a great cross from the right towards a well-positioned Theo Walcott in the middle, only to see Martin Skrtel stretch out a leg and divert the ball narrowly wide of his own net. And I emphasise ‘well positioned’, because although Theo doesn’t offer anything in the way of hold-up play, he does have intelligent movement in the box, something the man he replaced last night, Olivier Giroud, sorely lacks the vast majority of the time. The Frenchman has many good attributes to his game and I’m a fan but generally speaking, he’s a step or two behind his team-mates in his thinking, and that means more often than not, he’s in the wrong place at the right time to capitalize on service. That said, I’d have kept him on through the middle and replaced Sanchez with Walcott and brought on the Ox for Cazorla, who despite playing the pass of the game for Ramsey’s disallowed goal, struggled to find his form. In contrast, I thought Ramsey worked well in both directions from our right flank and could have moved in alongside Coquelin. And it was telling I felt, that their left-back Joe Gomez had such a good night down that side because Ramsey rarely stayed out wide when attacking. The Ox would have kept Gomez far more occupied and neutered the fullback’s attacking forays. But I suppose that’s hindsight for you and we now need to focus on what’s in front of us, which is St James’ Park and Newcastle at lunchtime on Saturday. Who we pick to start in the front six will be interesting as always, because I think we may just need a freshening up from last night’s lineup. Yet I don’t think we as fans, or more importantly Arsene as manager, truly know what our first choice selection looks like, because we have various players who can play multiple roles in our formation. It’s all a bit confused but the manager will have to work out the right mix to get us going, and quick, or we’ll find ourselves out of this title race sooner than we were the last.